Picture found on the internet and I’m not sure when it was taken, but Benslie Square (sometimes Bensley Square on the census) were purpose built miner’s cottages that were demolished in the 1930s. I suspect the picture was taken not that long before then. They were situated off the B785 east of Kilwinnning, next to Benslie Wood, where there is now a small cul de sac called Benslie Row, and were owned by the coalmaster company Archilbald Finnie and Son. They were built in the early 1840s. 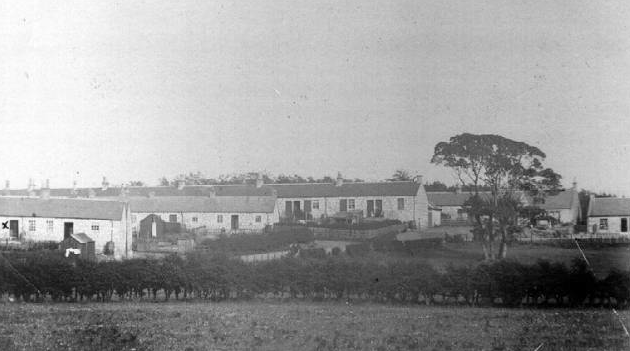 An article written by Chris Hawksworth for Ayrshire Notes volume 41 says about Archilbald Finnie, born 1783 at Kilmarnock, “He had taken over the tack for the Fergushill pits near Kilwinning by 1836, and by 1841 he had started building miners rows at Bensley to accommodate his workers at the expanding Fergushill pits, which were a quarter mile from the rows” and that “The Bensley miners’ rows were expanded in 1857 as Archibald’s mining interests in the Fergushill area flourished. In 1854, he also arranged with the owners of the adjacent Doura mine to work the particular coal seams he had started mining at Auchenwinsey into the Doura estate property”. He encouraged good upkeep of his rows by awarding prizes to the families who had the best-kept cottages, but in 1861 dismissed and evicted those miners who went on strike and made other coal masters agree not to house them. But he also built the Fergushill Church, a school and the Sprinside Institute, and started a savings bank for miners. In the 1861 census my great-grandfather Joseph Strachan was the tenant at 34 Bensley Square. He was a coal miner age 28 with his wife Jean and children Amelia age 6 and Robert age 1. There had been a daughter Margaret Haggerty Strachan born in 1857 but she had died at less than one month old. They hadn’t been there long as son Robert was born at Kenneth’s Row, Kilwinning and they wouldn’t stay there long as their next child, Flora, was born at Lamont’s Row, Kilwinning. Pictures are proving popular, so I’ll add what I can. 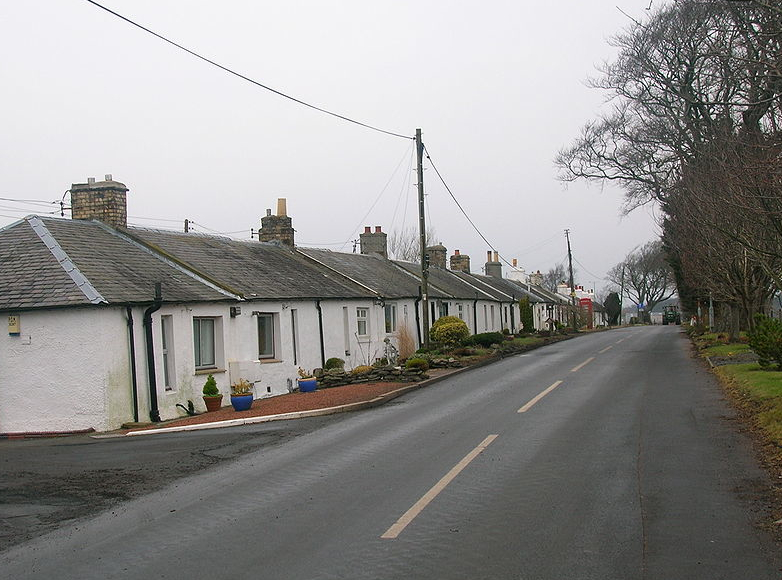 This one is of Perceton Row, near Dreghorn in Ayrshire. These cottages are fairly unique in that they were built as a miners’ row and have survived: nearly all other ones are long since demolished. I have lots of Strachan ancestors living here at the time of the 1841 census. My GGGG Uncle Robert Strachan, his wife, a granddaughter, a domestic servant and a lodger were in one of them. In another cottage was Robert’s son Andrew with his wife and four young children, and in another was Robert’s son John with his wife and two young children. Samuel Strachan, son of my GGGG Grandfather John Strachan was in yet another of the cottages with his wife and their first child. The men were most probably working at Perceton Colliery. The row was likely to have been built by the mine owner for the colliery’s workers. I suspect Perceton Row would have been quite new in 1841, which may be one reason why so many Strachans moved in order to work at Perceton Colliery.